Apart from the many lovely garden varieties and hybrids of the Common Lilac mentioned below there are a few natural species in which a trade is done. Amongst these may be mentioned S. amurensis, 5-6 ft. high, from China and Japan, with broadly ovate leaves and dense rounded trusses of creamy-white flowers; S. chinensis (dubia, rothomagensis), 4-6 ft. high, with ovate lance-shaped leaves, and deep-violet flowers, supposed to be a hybrid between persica and vulgaris. S. Emodi, 6 ft. high, from the Himalayas, has large broadly elliptic or ovate leaves, and purple or white flowers; there is a variegated form. S. japonica (fig. 445) attains a height of 30 ft. in Japan, and has pale-red bark, broadly ovate leaves, and white flowers in panicles 1 ft. or more long. S. Josikoea, 5-10 ft. high, from Hungary, has elliptic lance-shaped wrinkled leaves, and produces its bluish-purple flowers later than other species. 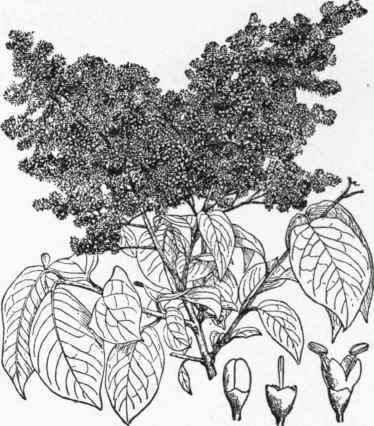 S. oblata, with purple, and S. pekinensis, with white flowers, both come from China. S. persica, the Persian Lilac, grows 4-7 ft. high, and has small lance-shaped leaves and bluish-purple flowers, but has also a white-flowered variety, alba, and a rosy one, rubra. Alba grandiflora, alba virginalis, Marie Legraye, Florent Stepmann, Reine Elizabeth, Mdme Moser. Mdme Lemoine, Mdme Abel Chatenay, Princess Clementine, Miss Ellen Willmott, Mdme Casimir Perrier. E. Lemoine, La Tour d'Auvergne, Leon Simon, Souv. de L. Spath, Virginite, Charles X, Louis Van Houtte, Dr. Lindley, Philemon, Geant de Batailles, Gloire d'Angers, Leon Mathieu, Leopold II, Macrostachya, Roi Albert, J. D. Messemalker, President Massart, Jacques Callot, Ville de Troyes, etc. Abel Carriere, Alphonse Lavallee, Charles Joly, Le Gaulois, Jean Bart, President Grevy, Emile Lemoine, Concordat, Prince de Beauveau, Maurice de Vilmorin, Mdme Leon Simon, Due de Massa, Renoncule, Michel Buchner, Marc Micheli, President Carnot, etc. Most of these varieties, single and double, are easily forced into early bloom when grown in pots and placed in a warm greenhouse from Christmas onwards. The masses of white Lilac, however, that find their way to the florists' shops before and after Christmas are not produced in this way. Plants are grown specially for this purpose, and the variety used is a purple-flowered one known as the "Marly". Thousands of this are grown in nurseries outside Paris, but few growers try the forcing business in England. Some of those who have done so have relinquished it, chiefly owing to the great drop in prices of late years, quite 50 per cent. Fig. 445. - Syringa japonica. Plants that are to be forced are grown outside for at least three but usually four years, and are from 4-5 ft. high, each having roughly about three dozen shoots. From the top of each shoot two trusses of bloom (rarely more) are developed. The plants are lifted and placed in darkened houses in which a temperature of about 80° F. is maintained when growth has started, and also a very humid atmosphere. The exclusion of light during the day is one of the chief secrets of the process of forcing a purple Lilac to produce pure-white flowers, but great judgment is necessary as to when deep or partial shade is to be maintained. Some French growers have found that a very high temperature and total darkness are not absolutely essential, and have produced white flowers in other ways. Other experiments have been carried out by keeping the plants to be forced in a refrigerator or cold dark and moist shed for about a fortnight before transferring them to the forcing house, and it was found that flowers were fit to cut a week earlier than from plants that had not been treated in the same way. Lilac plants have also been etherized in hermetically sealed chambers for about forty-eight hours to test the bleaching effect on the blossoms. By whatever process the flowers are obtained, there is nearly always a good demand for them, and it only remains to produce them at a cost that will leave a reasonable margin of profit.